BosBee Quilting: Winter is back. Very cold and snowy today. We were suppose to take my 89 year old mom to her hair appointment but she decided not to go. This made me very happy since I do not like to drive in snow. I forgot to take any pictures of the snow today but here is a picture I took a year or so ago. 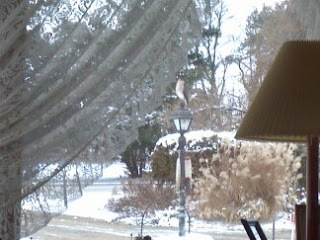 If you look closely your will see a red tailed hawk sitting on top of my light post. I love bird watching but I did chase Mr. Hawk away from my bird feeders. He had to get his lunch in the woods behind us that day. Every once in a while I see a visiting hawk in our back yard. Usually it it perched high up in my trees and I can see him from my second story office window. Your red and white quilt is so beautiful!! Love how you quilted it! I glanced through your other messages an you have some other gorgeous quilts! Thank you for stopping by my blog leaving a comment. So appreciate it. Hope you have a warm day. I don't see much snow in Charlotte, NC. It is so pretty to see in pictures.